Umm..I just have to start off by saying that these are *officially* my daughter's (and perhaps mine as well) new favorite cookie bar. 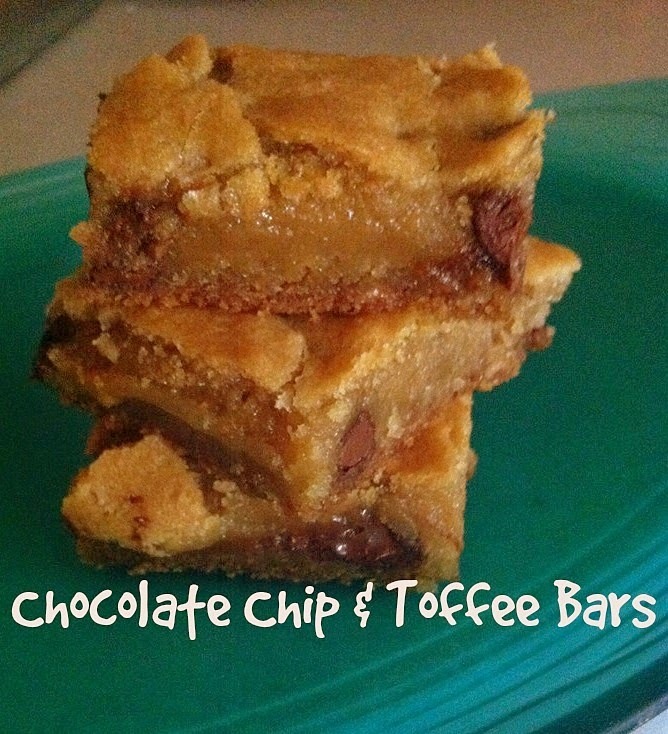 I whipped these up yesterday and was expecting my usual chocolate chip cookie bars. I don't know why I never mastered such a simple thing! Well, my foodie friends I am here to say that this is my new winning combination of ingredients to get a tasty cookie bar! They came out soft all around (even on the edges) and the center was nice and super soft, but now raw. Even though in the photo it kind of looks doughy...trust me, it wasn't! I typically only add chocolate chips, and decided to get a bit of that nutty, caramelish flavor I love so much by subbing some of the chocolate for toffee chips. I also lowered my baking temperature in the oven, and made sure I lined my pan with foil first before putting the batter in. Line a 8x11 baking dish with foil and then spray with non-stick cooking spray. In a mixer, beat together the butter, sugars and eggs until light fluffy. Add in the vanilla and continue to mix. Slowly add the flour, adding the baking soda and salt when you first add the flour. Continue to beat until just combined. Fold in the chocolate and toffee chips. Spread into the foil-lined pan, pressing down with wax paper or parchment paper to get as even as possible. Remove from the oven and let cool on a wire rack for about a half an hour, then pull the bar out with the foil to let cool completely. Slice with a serrated knife, I used a bread knife.